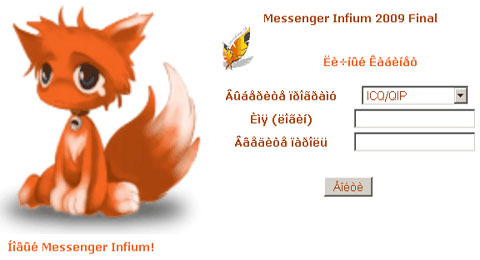 Messenger Infium 2009 is a rogue software, it is a false anti-spyware application that is generally installed in the user’s computer by dangerous trojans (such as Zlob and false video codecs), but it can also be installed manually by the victim. Once the your computer is infected with this parasite, it will immediately displays security warnings, alerts and system scans stating that your computer is heavily infected. These warnings are all false and are only displayed to make you think your computer is truly infected and that it is necessary to buy the full version of the software to remove the so-called infections. Make sure to not fall in this scam, if your computer is infected with Messenger Infium 2009, it is recommended to remove it immediately and to scan your system with a real security software. How to remove Messenger Infium 2009 (manual removal) ? How to remove Messenger Infium 2009 (automatic removal) ? Posted by admin on Thursday, June 4th, 2009 at 9:18 pm	and filed under Rogue Software with tags AdmDll.dll, Backdoor.Radmin, rogue. You can skip to the end and leave a response. Pinging is currently not allowed.